What Kind of Instruction do Dyslexics Need? Multisensory, simultaneous – Because of weakness in decoding, dyslexics function better when as many senses as possible are engaged in receiving input for the brain to process and understand. And, if at all possible, the input should be simultaneous. An example of this would be partner reading. 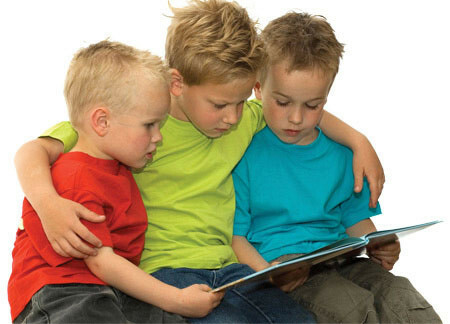 When a competent reader is reading in unison with a struggling reader, the struggler sees the words on the page (visual sense), hears the word read correctly by the partner (auditory sense), and feels the muscles in the mouth and throat move as s/he produces the sounds involved (kinesthetic sense). It is no surprise that partner reading is a successful form of instruction for dyslexics. Systematic – Dyslexics need structure to organize their learning. This applies to any subject, but especially to reading. Phonics instruction falls under this category and must be taught in a predictable, logical manner with lots of practice. Dyslexic minds are searching for order and reason in anything they try to learn. That’s why reading is so hard; there are so many words that aren’t predictable. You must provide a logical framework for them to build upon. Direct Instruction – Direct instruction means that the teacher explains everything clearly and demonstrates the steps involved. For dyslexics, this usually works best in a small group so they can tune in better (and so the teacher can better tune into them). They’re more comfortable in small groups and will be much more willing to participate without the emotional barriers that prevent them from participating in a large group. They need direct guidance from the teacher. Their minds tend to be disorganized; direct instruction helps them sort and remember their learning. Correct Pacing – Dyslexics need to move at the correct pace, not too slow and not too fast. This requires more progress-monitoring than is needed for “normal” students. This applies just as much to older students who have become convinced they’re “dumb” as it is for the younger ones. The pace needs to push them along, but not jeopardize their growing confidence. Whole-to-Part – Dyslexics need to see the “Big Picture,” then move on to the details. They can learn practically anything if they understand how it fits into a pattern. In other words, we must help them organize new information into a sensible pattern within their prior knowledge. When constructing their knowledge, they need to see the shape of the building before they start counting the bricks in the walls. This is essential for them to succeed. A simple example of this would be teaching students to use graphic details when reading non-fiction. When given a reading assignment in a textbook, they do better if instructed to read all the headings, charts, and picture captions before reading the main text. They rely heavily on context clues, and this gives them a framework of understanding before they ever start to read. These are skills that good readers use, but they must be taught explicitly to struggling readers. These five techniques are just plain good instruction for all readers—but they’re critical for dyslexics as well as other struggling readers.